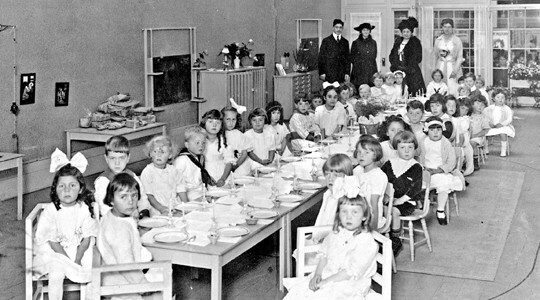 January 6, 1907, she opens, as per the request of the City Hall of Rome, « la Casa dei Bambini », the first Montessori school. It welcomed 60 children between 3 and 6 years old. By observing the children, Maria Montessori discovered the attention and concentration phenomenon in children of 3 years of age. She theorized what she later called “her experimental contribution” in which she describes the stages of development of young children. With the success of the school, she then opened other schools in Italy, then in Europe (the first Montessori school in Paris opened in 1912), she trained new educators and organized training workshops in London that welcomed up to 5,000 educators. She was then invited all around the world. From 1921 to 1931, she participated in the works of the International League for New Education and is internationally recognized in education. In 1929, she built the Association Montessori Internationale with a first convention the same year at Elsinore in Denmark. The first supporters were famous people: Sigmund Freud, Jean Piaget, one of the founders of 20th century psychology as well as writer and Indian philosopher Rabinfranath Tagore.